The final step before the signing was the “power of attorney”, the papal authorisation of the nuncio to Poland to act on his behalf. For this was no unofficial “protocol”, like the 1950 Modus vivendi between the Polish episcopate and the Communists, but rather a full-fledged concordat. When a non-confidence vote at the end of May placed Poland under “presidential rule” the Vatican and its allies saw their chance. The concordat was made ready, the Pope quickly issued this authorisation to the nuncio (papal ambassador) to Poland to sign it, and he did so only three weeks later while parliament was still in recess. 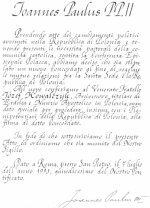 The nuncio needed this papal “power of attorney” to act on his behalf because, unlike the 1950 Modus vivendi between the Polish Bishop's Conference (episcopate) and the Communists, this was a treaty with the Vatican. Thus when the MPs returned to work after the September elections, they found a concordat with the Holy Father already awaiting their ratification. Taking note of the political changes that have occurred in the Republic of Poland and taking into consideration the pastoral needs of the Catholic community, having listened to the Polish Episcopate, We have decided that a new Concordat will be made in order to regulate mutual relations between the Holy See and the Republic of Poland. To this end We confer on the Venerable Brother Józef Kowalczyk, Titular Archbishop of Heraclea and Apostolic Nuncio to Poland, a special mandate to proceed, together with the Plenipotentiaries of the Republic of Poland, to the signing of said Concordat. In faith whereof, We undersign the present Act and order that it be provided with Our Seal. Given in Saint Peter's, Rome, on 7th July of the year 1993 in the 15th year of Our Pontificate. Note: “PP.” stands for “Papa Pontifex” (literally, “Father Pontiff”). This does not appear in the official list of titles, but is commonly used in the headings of documents and in their signatures.